Thanks to the geographical location of Mainz, it can be easily reached from virtually all directions. ICE trains stop in Mainz. The main train station is right in the city centre, and the major tourist attractions are within walking distance or can be reached by public bus. Deutsche Bahn assists disabled passengers with a range of services. Frankfurt International Airport also known as RheinMain Airport is about 20 minutes by car from Mainz and has excellent international flight connections as it is the main German air traffic hub. 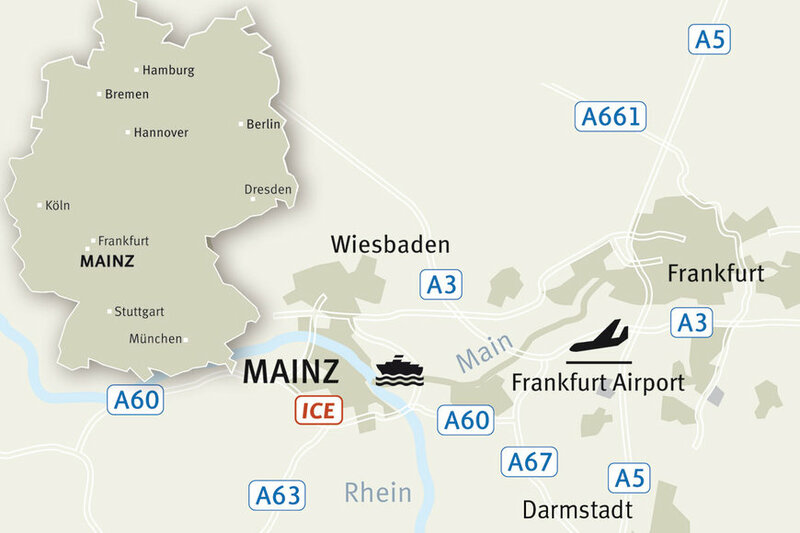 Frankfurt Hahn airport can be reached in about 60 minutes, and there is a bus service from Mainz. After arriving in Mainz, your best option to move around is by public transport. If you live in the Rhine-Main area, the regional transport service will bring you to Mainz. For local public transport timetables, etc., click here. If you intend to bring your own car to Mainz, please note that the city of Mainz is a Green Zone area. The parking operator Mainz GmbH runs a parking guidance and information system that brings you to the nearest parking facility with free places. For detailed information on car parks, click here. The innovative web platform of Green Mobility allows you to compare the various travel options, identifying the most comfortable and environmentally friendly way for you to travel to Mainz.